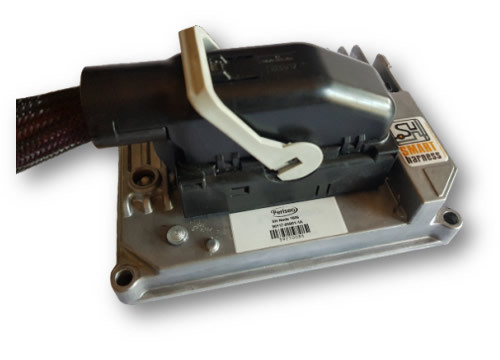 The SH-ECM-1612 is a high current input/output (I/O) device that interconnects via the Controller Area Network (CAN), to other electronic control modules (ECMs) in a vehicle. Multiple ECMs are deployed as standardized interfaces to control various body functions in a vehicle. I/Os can be configured to control and provide power to indicators, wipers, headlights, fans and numerous other loads in the vehicle. The SH ECMs are interchangeable; keeping the harness standardized thus enhancing implementation and maintainability. It may also be deployed as a stand-alone general purpose/special function controller. A sufficient number of ECMs strategically distributed throughout a vehicle, substantially simplifies the wire harness design and eliminates any need for fuse and relay circuits. Continuous total load current up to 70A. Twelve configurable highside driver outputs (70A total). Physical size (mm): 155 x 115 x 46 (W x L x H).